Kieran Robertson, Anna Massara ’18, and her students. 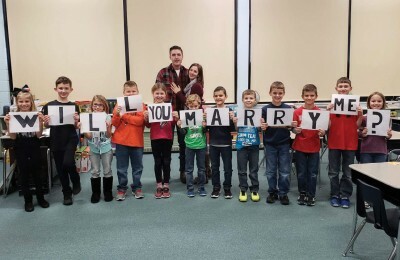 When the time came for Kieran Robertson to propose to his girlfriend Anna Massara ’18 in December, Robertson colluded with Massara’s class of third-graders to ensure everyone got points for participation. Robertson also enlisted Massara’s school principal and a fellow teacher at St. Peter Catholic School in Upper Sandusky, Ohio, to surprise her on the last day of class before winter break. Her students, who already knew the Navy man Robertson from community events like Veterans Day presentations, were crucial co-conspirators. “Because this is my first class I’m teaching out of college and he’d already established a relationship with them, it was perfect for me,” Massara says. Both Massara and Robertson graduated from Upper Sandusky High School in 2014. They connected after Robertson was honorably discharged from the Navy while Massara was a senior at OWU. “And of course when he proposed, I said yes,” she says.